I don’t know if you’ll be able to tell, but I’m easing myself back into writing. I got a bit sidetracked for a few months with two worthwhile and important projects. The first was serving as Marcia Conner’s “Developmental Editor” (that’s the title she gave me) in creating a revised, updated second edition of the book she co-authored with Tony Bingham – The New Social Learning. As a side note here, let me say that working with Marcia is something I did about a year ago and, now as then, she is one of the best people I have ever had the pleasure of sharing work with. She is focused, brilliant, indefatigable (unlike moi), as well as kind, understanding, and generous. There were times when I felt a bit burned out, but it wasn’t because of Marcia and, truth to tell, her energy helped me get cracking when all I felt like was creaking. At any rate, it was a decent sized project and, unfortunately, it came to fruition at just about the same time I returned to Rocketdyne (now Aerojet Rocketdyne) as a full-time contractor. So I was working all day at Rocketdyne, then spending my evenings (not all of them, but plenty) working with Marcia. I took two Wednesdays off toward the deadline we had set and I worked Saturdays and Sundays (again, not all of them). I’ve been a wee tad distracted, is what I’m getting at here and, unfortunately, I wasn’t able to fit in writing during this time, with the exception of some fairly extensive posts on Facebook, where I get the most feedback. I thought I would take a moment to share a little bit of info about the City I live in, Simi Valley, CA. Simi is quite (in)famous for at least two, frequently three, major things. I wasn’t going to point them out, because I’d like to see some of it go away. I decided, however, to name them as they are primarily negative. Even the one thing that many in the City see as a major positive accomplishment, is not without its controversy. Those things are, in no particular order: The Rodney King acquittals, which triggered the 1992 Los Angeles riots; what is inarguably the worst nuclear meltdown in U.S. history; and we are home to the Ronald Reagan Library and Museum. This is how Happy Face Hill looked in wetter times. There is another thing, but I’m pretty sure it’s only meaningful to the people who live here in Simi. 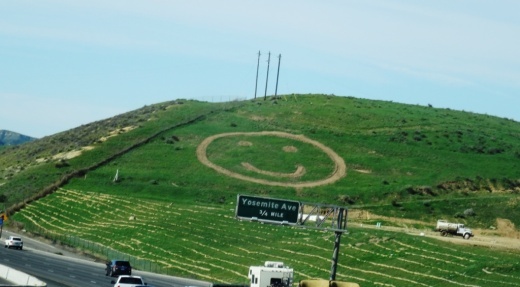 We call it “Happy Face Hill” and it even has its own Facebook page. Actually, the story surrounding its creation in 1998 and its evolution since then is a strange, wonderful, yet torturous one. You can read more about it here and here. There’s a sentence in the first story that, given the historical drought we find ourselves in, I find ironic – “The restoration ecologist said the happy face will look more natural once it rains.” Part of the story involves the Rotary Club I belong to, The Rotary Club of Simi Sunrise which, now that I think about it, is responsible for another thing Simi is well known for, The Simi Valley Cajun & Blues Festival. Our 26th annual affair, which attracts thousands of Blues and Zydeco fans from around the globe takes place every Memorial Day weekend, which means it’s in two days. I’m volunteering about 16 hours over the weekend. So this is me, welcoming me back, just like Happy Face Hill welcomes me home when I return from work or visiting family. Now that I’m working, I have quite a few things I’d like to write about. I’ve been somewhat apprehensive about doing so, as I don’t wish to invoke the corporate immune system which, since Rocketdyne was purchase by Aerojet, may have a bit more of a hair trigger than I’ve experienced in the past. I’m working on it. Stay tuned! This entry was posted on Thursday, May 21st, 2015 at 8:44 pm	and posted in Professional. You can follow any responses to this entry through the RSS 2.0 feed.